Early modern warfare is associated with the start of the widespread use of gunpowder and the development of suitable weapons to use the explosive, including artillery and firearms; for this reason the era is also referred to as the age of gunpowder warfare (a concept introduced by Michael Roberts in the 1950s). 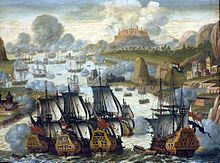 This entire period is contained within the Age of Sail, which characteristic dominated the era's naval tactics, including the use of gunpowder in naval artillery. The Russo-Turkish Wars, Ottoman–Habsburg wars, and other Ottoman wars in Europe. In the Horn of Africa, the Adal's conquest of Ethiopia and the involving of the Ottomans, Mamluks and the Portuguese. Throughout the 18th century the "Second Hundred Years' War", an umbrella term which includes the Nine Years' War, Seven Years' War, War of the Spanish Succession, War of the Austrian Succession, and finally the American War of Independence (American Revolutionary War), French Revolutionary Wars and Napoleonic Wars of the late 18th to early 19th centuries which mark the end of this era. The earliest existent Chinese formula for gunpowder is recorded in the Wujing Zongyao manuscript published by 1044, while the fire lance, an early firearm, was used by Song Chinese forces against the Jin during the Siege of De'an in 1132. The earliest surviving bronze hand cannon, dates to 1288, during the Mongol-led Yuan Dynasty of China. Gunpowder warfare was used in the Mongol invasions of Japan in 1274 and 1281, specifically in the form of explosive bombs fired from catapults against enemy soldiers. Japanese scrolls contain illustrations of bombs used by the Yuan-Mongol forces against mounted samurai. Archaeological evidence of the use of gunpowder include the discovery of multiple shells of the explosive bombs in an underwater shipwreck off the shore of Japan, with X-rays providing proof that they contained gunpowder. In 1326, the earliest known European picture of a gun appeared in a manuscript by Walter de Milemete. In 1350, Petrarch wrote that the presence of cannons on the battlefield was 'as common and familiar as other kinds of arms'. 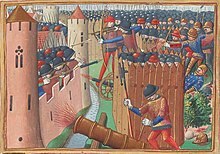 Early artillery played a limited role in the Hundred Years' War, and it became indispensable in the Italian Wars of 1494–1559. Charles VIII, during his invasion of Italy, brought with him the first truly mobile siege train: culverins and bombards mounted on wheeled carriages, which could be deployed against an enemy stronghold immediately after arrival. The period from 1500–1801 saw a rapid advance in techniques of fortification in Europe. Whereas medieval castles had relied on high walls to keep out attackers, early modern fortifications had to withstand artillery bombardments. To do this, engineers developed a style of fortress known as the trace italienne or "Italian style". These had low, thick, sloping walls, that would either absorb or deflect cannon fire. In addition, they were shaped like stars, with bastions protruding at sharp angles. This was to ensure that every bastion could be supported with fire from an adjacent bastion, leaving no "dead ground" for an attacker to take cover in. These new fortifications quickly negated the advantages cannon had offered to besiegers. The power of aristocracies vis à vis states diminished throughout Western Europe during this period. Aristocrats' 200- to 400-year-old ancestral castles no longer provided useful defences against artillery. The nobility's importance in warfare also eroded as medieval heavy cavalry lost its central role in battle. The heavy cavalry - made up of armoured knights - had begun to fade in importance in the Late Middle Ages. The English longbow and the Swiss pike had both proven their ability to devastate larger armed forces of mounted knights. However, the proper use of the longbow required the user to be extremely strong, making it impossible to amass very large forces of archers. The proper use of the pike required complex operations in formation and a great deal of fortitude and cohesion by the pikemen, again making amassing large forces difficult. Starting in the early 14th-century, armourers added plate-armour pieces to the traditional protective linked mail armour of knights and men-at-arms to guard against the arrows of the longbow and crossbow. By 1415, some infantrymen began deploying the first "hand cannons", and the earliest small-bore arquebuses, with burning "match locks", appeared on the battlefield in the later 15th century. In virtually all major European battles during a period of 250 years (1400 to 1650), many soldiers wore extensive plate armour; this includes infantrymen (usually pikemen) and almost all mounted troops. Plate armour was expected to deflect edged weapons and to stop an arquebus or pistol ball fired from a distance, and it usually did. The use of plate armour as a remedy to firearms tended to work as long as the velocity and weight of the ball remained quite low, but over time the increasing power and effectiveness of firearms overtook the development of defenses to counteract them, such that flintlock muskets (entering use after 1650) could kill an armoured man at a distance of even 100 yards (though with limited accuracy), and the armour necessary to protect against this threat would have been too heavy and unwieldy to be practical. 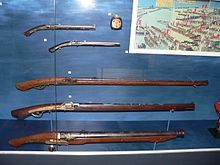 The flintlock musket, carried by most infantrymen other than pikemen after 1650, fired a heavier charge and ball than the matchlock arquebus. A recruit could be trained to use a musket in a matter of weeks. Since the early muskets lacked accuracy, training in marksmanship was of little benefit. Operating a musket did not require the great physical strength of a pikeman or a longbowman or the fairly rare skills of a horseman. Unlike their arquebus predecessors, flintlock muskets could neutralize even the most heavily armoured cavalry forces. Since a firearm requires little training to operate, a peasant with a gun could now undermine the order and respect maintained by mounted cavalry in Europe and their Eastern equivalents. Although well-smithed plate-armour could still prevent the penetration of gunpowder-weapons, by 1690 it had become no match for massed firearms in a frontal attack and its use ended, even among the cavalry. By the end of the 17th century, soldiers in the infantry and most cavalry units alike preferred the higher mobility of being completely unarmoured to the slight protection - but greatly lessened mobility - offered by wearing plate armour. The arquebus, in use from 1410, was one of the first hand-held firearms that were relatively light (it still required a stand to balance on) and a single person could operate one. One of these weapons was first recorded as being used in the Battle of Agincourt in 1415, although this was still very much a medieval battle. The term musket originally applied to a heavier form of the arquebus, which fired a shot that could pierce plate armour, though only at close range. In the 16th century it still had to be mounted on a support stick to keep it steady. The caliver was the lighter form of the arquebus. By 1600, armies phased out these firearms in favour of a new lighter matchlock musket. Throughout the 17th century and up until 1690, muskets used the matchlock design. However, the matchlock design was superseded in the 1690s by the flintlock musket, which was less prone to misfires and had a faster reloading rate. By this time, only light-cavalry scouting units, "the eyes of the army", continued to wear front and back armour plates to protect themselves from distant or undisciplined musket-equipped troops. However, the main reason was that armies were now much bigger, but logistical support for them was inadequate. This meant that armies tended to devastate civilian areas in an effort to feed themselves, causing famines and population displacement. This was exacerbated by the increasing length of conflicts, such as the Thirty Years' War and Eighty Years' War, which fought over areas subjected to repeated devastation. For this reason, the wars of this era were among the most lethal before the modern period. For example, the Thirty Years' War and the contemporary Wars of the Three Kingdoms, were the bloodiest conflicts in the history of Germany and Britain respectively before World War I. Another factor adding to bloodshed in war was the lack of a clear set of rules concerning the treatment of prisoners and non-combatants. While prisoners were usually ransomed for money or other prisoners, they were sometimes slaughtered out of hand - as at the battle of Dungans Hill in 1647. One of the reasons for warfare's increased impact was its indecisiveness. Armies were slow moving in an era before good roads and canals. Battles were relatively rare as armies could manoeuvre for months, with no direct conflict. In addition, battles were often made irrelevant by the proliferation of advanced, bastioned fortifications. To control an area, armies had to take fortified towns, regardless of whether they defeated their enemies' field armies. As a result, by far the most common battles of the era were sieges, hugely time-consuming and expensive affairs. Storming a fortified city could result in massive casualties and cities which did not surrender before an assault were usually brutally sacked -for example Magdeburg in 1631 or Drogheda in 1649. In addition, both garrisons and besiegers often suffered heavily from disease. This transformation in the armies of Europe had great social impact. J. F. C. Fuller famously stated that "the musket made the infantryman and the infantryman made the democrat." This argument states that the defence of the state now rested on the common man, not on the aristocrats. Revolts by the underclass, that had routinely been defeated in the Middle Ages, could now conceivably threaten the power of the state. However, aristocrats continued to monopolise the officer corps of almost all early modern armies, including their high command. Skirmishers - Skirmishers were not a common infantry unit until late in the 18th Century. Light infantry would advance and be the first to fire to draw the enemy to attack, while also probing the flanks. In later eras, sharpshooters would not only target common soldiers, but also officers so that the men were without leadership. Dragoons were intended to travel on horseback but fight on foot and were armed with carbines and pistols. Even orthodox cavalry carried firearms, especially the pistol, which they used in a tactic known as the caracole. Cavalry charges using swords on undisciplined infantry could still be quite decisive, but a frontal charge against well-ordered musketeers and pikemen was all but futile. Cavalry units, from the 16th century on, were more likely to charge other cavalry on the flanks of an infantry formation and try to work their way behind the enemy infantry. When they achieved this and pursued a fleeing enemy, heavy cavalry could still destroy an enemy army. Only a specialised cavalry units like winged hussars armed with long lances could break pikemen lines, but this was rather an exception. After wars with Polish-Lithuanian Commonwealth, when he fought often against superior mounted troops, King Gustavus II Adolphus started using successfully cavalry melee charge more often instead of caracole like during Battle of Breitenfeld. The cavalry charge remained an important part of battle tactics for the rest of 17th century and until the modern area, and its shock value could be decisive when implemented properly. The one exception to this was the Ottoman Empire, which had been founded by Turkish horsemen. The Ottomans were some of the first to embrace gunpowder artillery and firearms and integrated them into their already formidable fighting abilities. As European infantry became better armed and disciplined, by about 1700, the Ottoman forces began to be regularly defeated by the troops of the Austria and Russia. The Ottoman Empire had been one of the first Middle Eastern states to effectively use gunpowder weapons and used them to great effect conquering much of the Middle East, North Africa, and the Balkans. In the 17th century the state began to stagnate as more modern technologies and strategies were not adopted. Specifically, the Ottoman Empire was slow to adopt innovations like boring cannon (rather than casting them in a mold), making the conversion from matchlock firearms to flintlocks, and the lightening of field guns and carriages. Firearms have been in use since the beginning of the dynasty, and field armies in battle formation have found them convenient and useful to carry along...Since muskets have been transmitted to China, these weapons have lost their effectiveness...In battle formation, aside from various cannon such as the "three generals", the breech-loading swivel gun, and the "hundred-league thunder", nothing has more range or power than the Ottoman musket. The next best is the European one. The Ottoman Empire was one of the first states to put gunpowder weapons into widespread use. [dubious – discuss] The famous Janissary corps of the Ottoman army began using matchlock muskets as early as the 1440s. The army of Mehmed the Conqueror, which conquered Constantinople in 1453, included both artillery and foot soldiers armed with gunpowder weapons. The Ottomans brought to the siege sixty-nine guns in fifteen separate batteries and trained them at the walls of the city. The barrage of Ottoman cannon fire lasted forty days, and they are estimated to have fired 19,320 times. After the death of Selim, he was succeeded by his son Suleiman the Magnificent. During his reign, gunpowder weapons continued to be used effectively. One important example is the Battle of Mohács in 1526. During this battle, Ottoman artillery, and Janissaries armed with muskets, were able to cut down charging Hungarian cavalry. This enormous artillery produces great damage when it hits, but it is awkward to move and it requires too much time to reload and site. Furthermore, it consumes a great amount of powder, besides cracking and breaking the wheels and the carriages and even the ramparts on which it is placed ... our artillery is more handy and more efficient and here resides our advantage over the cannon of the Turks. Soon after the Ottoman Empire, two other Muslim gunpowder empires appeared: the Safavid Empire in Iran and the Mughal Empire in India. They both began in the early 16th century but later collapsed in the 18th century. Western arquebuses and matchlocks were imported into Vietnam during the 16th century. The raging and lengthy wars between Le and Mac dynasties, and later Trinh and Nguyen clans invoked an arm race between the opposing factions. Gunnery and marksmanship rapidly spread across the country and soon Vietnamese musketeers became famous within Asia as masters of firearms. ^ Needham, Joseph (1986), Science & Civilisation in China, V:7: The Gunpowder Epic, Cambridge University Press, p. 118-124, ISBN 0-521-30358-3. ^ Ebrey, Patricia (1999), Cambridge Illustrated History of China, Cambridge: Cambridge University Press, p. 138, ISBN 0-521-43519-6. ^ Stephen Turnbull (19 February 2013). The Mongol Invasions of Japan 1274 and 1281. Osprey Publishing. pp. 41–42. ISBN 978-1-4728-0045-9. Retrieved 16 April 2013. ^ a b Nicolle, David (1995). The Janissaries. Osprey. p. 22. ISBN 1-85532-413-X. ^ Chase, Kenneth (2003). Firearms: A Global History to 1700. Cambridge University Press. p. 2. ISBN 0-521-82274-2. ^ Nicolle, David (2000). Constantinople 1453: The end of Byzantium. London: Osprey. pp. 29–30. ISBN 1-84176-091-9. ^ Nicolle, David (1983). Armies of the Ottoman Turks 1300-1774. Osprey. pp. 29–30. ISBN 0-85045-511-1. ^ Kinross, Lord (1977). The Ottoman Centuries: The Rise and Fall of the Turkish Empire. HarperCollins. pp. 166–167. ISBN 0-688-08093-6. ^ Nicolle, David (1983). Armies of the Ottoman Turks 1300-1774. Osprey Publishing. p. 31. ISBN 0-85045-511-1. ^ Kinross, Lord (1977). The Ottoman Centuries: The Rise and Fall of the Turkish Empire. HarperCollins. pp. 186–187. ISBN 0-688-08093-6. ^ Roddam Narasimha (1985). Rockets in Mysore and Britain, 1750-1850 A.D. Archived 27 September 2007 at the Wayback Machine National Aeronautical Laboratory and Indian Institute of Science. Chase, Kenneth (2003), Firearms: A Global History to 1700, Cambridge University Press . Crosby, Alfred W. (2002), Throwing Fire: Projectile Technology Through History, Cambridge University Press . Kelly, Jack (2004), Gunpowder: Alchemy, Bombards, & Pyrotechnics: The History of the Explosive that Changed the World, Basic Books . Needham, Joseph (1986), Science & Civilisation in China, V:7: The Gunpowder Epic, Cambridge University Press .